The picturesque Wallowa Valley lies at the northeast corner of Oregon and bisects some the most fertile land in the region. The original home of the mighty Nez Perce people, the Wallowa Valley is a land rich in historic significance. 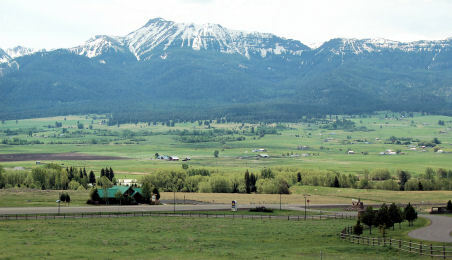 View of Ruby Peak, left of center, and the majestic Wallowa Mountains as seen from Highway 82 just west of Enterprise. The Nez Perce's expulsion from their lands some 70 years later by the U.S. government heralded a change for this valley, which gradually became populated by European pioneers. The names of many of the towns and geographic locations however, point to a history that is steeped in Native American culture. Locations like the Chief Joseph Peak and the Ollokot Village Site, both of which carry the names of Nez Perce leaders, stand as symbols of its early history. The Wallowa Valley can be best enjoyed by following the Hells Canyon Byway from La Grande (the intersection of Highways 84 and 82), east on Highway 82. The road leads through the farming and ranching towns of Imbler (noted as the "Grass Seed Capital of the World") and Elgin (the gateway to the Umatilla and Wallowa-Whitman National Forests) into the Wallowa Valley. The towns of Wallowa, Lostine, Enterprise and Joseph each reflect a unique part of the Northwest with their turn-of-the century towns, festivals and picture book scenic beauty.